Gorham China Items, including Norman Rockwell plates. If We Don't Have It, We Will Gladly Find It For You - FREE Worldwide Search Service. 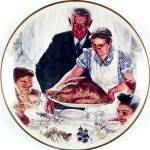 Norman Rockwell BUTTER GIRL plate is a first edition, Lakeshore Prints, 1973 and was a limited edition. This is in perfect condition; however, original box is not included. 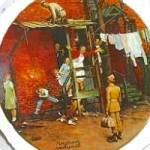 Many Many Dozen Rockwell Plates & other figures, ornaments & bells & misc. items Not Yet on This Site, or we'll gladly find even the most obscure ones for you. Blessed Holidays.